NetCommercial creates animation for websites professionally. We use state of the art software. Animation being a favorite for consumers Hollywood spends 100’s of Millions of dollars on animation. On this page you will find a video example of animation for websites. Also linked within this blog are articles where you will find statistics. Here is a link to a U.S Government Census study for online media. The ‘skinny‘ on that linked article? 75% of U.S Households use the Internet. How entertaining is your website? Is it as entertaining as my animation for websites 55 second example below? Consumers are so bombarded by advertising that the subconscious has trained itself to ignore it. Conversely, if your ad is entertaining the consumer is willing to watch it as long as it is short. This is where NetCommercial comes in. Creating short, entertaining, animation for websites geared for your product or service. Delivering your message within moments of a consumer visiting your website. As seen in the video example above I’ve animated a couple of cars using a 3rd party approach to messaging. This can be done for any product, service, or mascot desired. This particular animation for websites, is to get the attention of car dealers for advertising on their websites; or use on social media. What better way to have someone recall your brand or service by having them reflect on a 30 second entertaining spot? Heck, I cannot even look at a bag of Cheetos without thinking about that animated cool cat in his sunglasses, telling me how Cheesy they are! That is classic branding using animation. “The global accounting firm Ernst&Young is projecting that digital entertainment revenue will surpass that of traditional media by 2015. 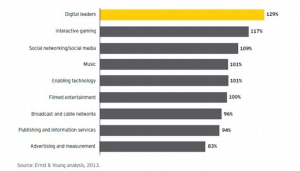 Ernst&Young surveyed more than 550 senior executives at different global media and entertainment companies for this report”. Animation is a favorite wouldn’t you say…Since Tom and Jerry for me. Let’s face it, cartoons are great! Animation for websites seem to be a made fit. Entertaining, while not being so predictable. Using a third party to demonstrate your brand or services strengths. Third party advertising is held in high regard, as is testimonial, opposed to being a self proclaimed article placed on your website. Email HERE for a quote some professionally produced animation for websites or a website commercial for strengthening your online presence. Website Commercials are inevitable. Animation for websites are a great way to brand and socialize your product or service. As always, we love to hear your thoughts and experiences in our comments. However due to Spam bots please use the term ‘animation for websites’ in the first sentence of your comment, so we know it is you, and not a spam bot.